A huge number of people end up at Nitro K-9 because their dogs won’t stop pulling. The vast majority of them have their dogs in harnesses. And of those, most also have their dogs in NO-PULL harnesses. You all know I loathe Gentle Leaders—but I’m pretty down on harnesses too. If you want the truth, sticking an untrained dog in a harness is probably one of the stupidest ideas positive trainers have come up with (and that’s saying something). I’m going to tell you why. Back to basics: Dogs pull because it feels awesome. As I noted in my article on the Gentle Leader, there’s a trajectory when it comes to pulling that goes like this: The dog usually starts on a flat collar, and people start to worry that the dog is going to choke himself to death. Prong collars are politically incorrect and so they are encouraged to use a harness. Most of the time, the harness makes pulling worse. So they’re told to get a no-pull harness. And if that doesn’t work, they stop walking the dog entirely, get a Gentle Leader, or call someone like me. This isn’t rocket science. Practically every dog on the planet needs to be trained not to pull when on a leash. Why? Because pulling is an inherently rewarding activity. The more dogs pull, the more they want to pull. The reason for this is the dog’s drive. And one of easiest ways to create drive in a dog is to restrain it. What do we mean by drive? You’ve probably heard people toss around terms like food drive, or prey drive or toy drive. But what is a drive, exactly? Fundamentally, a drive is an internal motivation that fulfills a hardwired need in a dog. All dogs have drives, but they have them in differing amounts. • Prey drive is what compels a dog to chase and kill its food. • Defensive drive is what motivates a dog to protect itself and how. You can break down defensive drives into two different categories: fight and flight. Contradictory as this sounds, drives are both simpler and more complex than is generally talked about in pet training circles. They are simpler, because when people talk about things like ball drive, or toy drive, what they are really talking about is prey drive. Prey drive is ALL the behaviors associated with killing prey—whether it’s the hunt, the chase, or the actual killing. But drives are also far more complex because they don’t exist in neatly wrapped individual packages; they interact with each other. A dog can switch between prey drive and defensive drive (this is what we do in protection work). Second, dogs have different levels of individual drives and different thresholds for each, by which we mean the point at which that drive overrides everything. Put together, these mean that every dog is very much an individual. Experienced trainers may disagree on many of the finer points—but ultimately, we know how to work with drives: how to turn them on, how to turn them off, and how to work with them to achieve what we want. And experienced trainers know that one of the best ways to BUILD drive is to restrain the dog. The more you restrain a dog, the more drive builds. Harnesses give power to pulling dogs. Think about it for a minute. The instant you stick a dog in a harnesses, she automatically has more pulling power. And trust me, she’s going to use it. 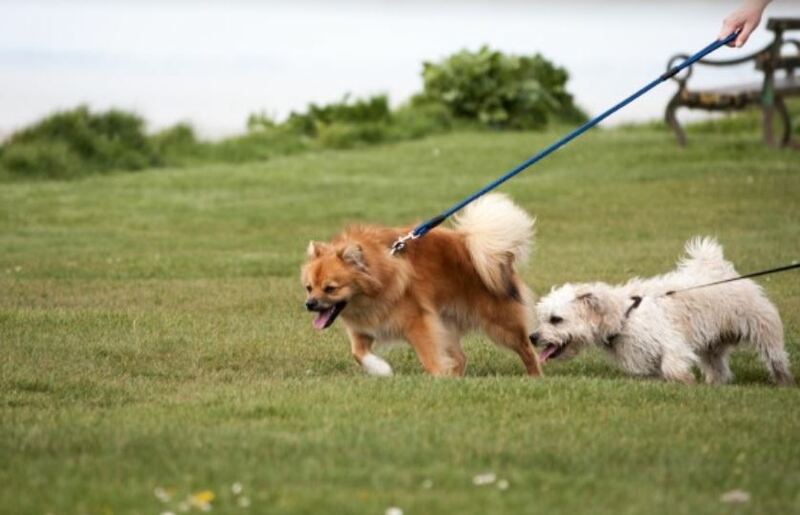 The fact is, most dogs like to pull—and most dogs will automatically pull harder when they’re in a harness. Why? Because they can. Do I use harnesses? Absolutely. Just at higher levels of training and very specific situations in which we want to build drive. When drive has nowhere to go, you start having problems. Pulling dogs are continually building drive. That drive has to go somewhere. If there’s no appropriate outlet, it’s going to get all twisted and leak out in ways we don’t want. Remember, dogs think by association. The food bowl means eat. The leash means walk. The tennis ball means running and playing fetch. So you have to ask—what associations is a dog making when he is pulling and building drive? What happens when there’s no outlet? He starts associating various things with how he is feeling. We have no idea what those associations are going to be. Much depends on the individual dog. He could be all amped up and get startled by a garbage can. Boom, there’s an association. Maybe he associates buses or bikes with frustration. Or maybe it’s a person. Or the dog starts making associations with other dogs. This is extremely common. And what happens when the dog makes an association? Well, the dog sees whatever the trigger is, and you’re going to see various reactions, which also depend on the dog and the types and thresholds of drives he has. You might see barking, lunging, snapping, or biting—and then that behavior becomes its own conditioned loop because it feels good to have that release. And before you know it, you’ve got behavior problems. That there are so many labels for this phenomenon speaks to what an issue it has become. Leash aggression, leash reactivity, leash frustration, frustrated greeters … It doesn’t matter what you call it, though. Unless you take control of the situation, it’s only going to get worse. Fact: Harnesses make it easier to pull. Fact: Pulling dogs generate drive, which makes them pull more. Fact: That built-up drive needs an outlet, and if not directed appropriately, the dog will find one. Million dollar question: Why use a harness when trying to teach a dog not to pull? Positive trainers like to focus endlessly on what operant conditioning quadrant something falls into. As far as I can tell, it’s mainly a way to feel good about their training choices. Truthfully, I find these discussions tiresome and limiting—and never more so than when it comes to using a collar versus using a harness. It’s not to say that we don’t use the principles of operant conditioning. We do. But framing the conversation around reward and punishment—and assigning a “good” value to one and a “bad” value to another—leads to black and white thinking. These people are unable to understand that the purpose of correction is NOT to punish a dog, but to change a behavior. Dogs do this all the time to other dogs. Look at how mama dogs “correct” their pups. Or look at adult dogs interacting. It is very common to see one dog “correct” another dog. They use their mouths and, yes, their teeth—and they deliver the correction to the neck. It’s not this big deal; it’s often even extremely gentle. And these dogs aren’t traumatized for life. They shake it off, correct the behavior, and move on. Good trainers do this too, and we do it through basic leash pressure. Leash pressure isn’t just correction; it’s communication. You can use leash pressure on any kind of collar, but we use a prong for training because it is more precise and you can communicate a lot more with a lot less leverage. A good handler can have an entire conversation with a dog using leash pressure. We can say, “Hey, you weren’t paying attention” or even “There’s nothing to be scared of.” I can get an anxious fearful dog on the end of my leash and have him visibly relax within minutes using a prong collar. I have clients who come to me after months of pulling, and within minutes the dog is walking calmly on a leash. Often, we are just snapping the dog out of drive. But the purely positive brigade has somehow decided that using a harness is a better option. Guess what? You can’t use leash pressure with a dog on a harness. That’s called restraint. Which builds drive. Don’t get me wrong … a dog pulling on a collar can be building pressure cookers of drive too. But putting a dog in a harness is starting at a disadvantage. Let’s go back to OC 101. Reinforcement INCREASES the likelihood of a behavior while punishment DECREASES the likelihood of a behavior. Logically speaking, you cannot use positive reinforcement to decrease a behavior. What you can do is offer another reward and hope that it’s more compelling to the dog than the behavior you don’t want. Once you get past all the fancy language, this is purely positive training in a nutshell. So there you have a dog in a harness that is possibly building up a bunch of drive. To get any kind of obedience, every single instance of pulling needs to be countered with something even more rewarding. More rewarding than chasing a cat. More rewarding than barking up a tree at a squirrel. More rewarding than just … pulling. Pretty tall order, don’t you think? Positive trainers are playing with fire. But I’ve been seeing something even more troubling lately. People are being told to use whatever the dog finds rewarding by positive trainers who have glommed onto the idea of drive-based training. Simply put, drive-based training is using a dog’s drive to motivate them to perform. Basically, these people have watched a couple of golden retrievers doing IPO and decided that this is an awesome idea. Now they’re telling others to use things like tugs, tennis balls, flirt poles, and other toys to motivate dogs into performing basic obedience. Can’t get your dog to walk nicely on a leash? Use a tennis ball as a reward! Can’t get your dog to sit? Use a flirt pole when they do it right! In other words, they’re training dogs while they’re in prey drive. Not good. Prey drive is a curious thing. It tends to insert itself in all sorts of aspects of dog behavior. And, given the opportunity, prey drive is always leading to something else. Being in any kind of drive is, by itself, an amplified state that intensifies everything around the dog in that instant. That means when you’re training in prey drive, it’s setting up a scenario in which the dog hyper-fixates on a toy. And because it’s powered by drive—much like pulling itself—it’s not just going to be a problem of getting the dog to perform without the toy. It’s also creating an unhealthy obsession, which means that the dog will often end up being defensive about the item itself. And I don’t mean just “defensive” here—I mean, that prey drive in this case can (and more often than not does) lead to defensive drive. This, by the way, is a classic example of how drives can interact, which is something that your average positive trainer or positive adherent dispensing advice on Facebook simply does not understand. And there is always going to be some kind of fallout, the magnitude of which is going to depend on the specific dog and the drives in question. Overall, I disagree with drive-based training for foundational obedience. My stance is that drive should always be developed only in the context of a specific purpose, with a specific application, and a specific goal in mind. However, there are many very good trainers who do use drive-based training for obedience. I have a philosophical difference, but can respect them because they know what they’re dealing with. They also understand how to work with those drives in a balanced system of reward and correction. Which positive people refuse to do. Which positive people can’t do even by default, if the dog is in a harness. Corrections snap a dog out of drive. Day in and day out, I see dogs in harnesses. They’re pulling, lunging, snapping, biting. They’re barking at other dogs, objects, or people. They’re dog reactive or outright aggressive. What presents itself can vary dramatically. But what all these dogs have in common is that they’ve been pulling for weeks, months, even years. They live in an amplified state every time they’re on a leash and, frankly, a lot of the time they’re not on a leash too because they’re in drive overload and this behavior leaks all over the place. What do we do? We take off the harness. We put on a prong collar. And we snap the dog out of it. The dog comes out of drive and focuses. We make it fun. The dog is on a loose leash, because what does a taut leash do? You got it—it builds drive. And we reward the dog with praise and affection. All of a sudden, the dog is doing something for you that is TANGIBLE. This is what builds relationship and a bond between canine and handler. And I don’t want to give you the impression that working in drive is always wrong. For instance, it can be great if you have a dog that will chase a ball, but won’t retrieve it. Tracking always happens while the dog’s in drive. So do many fun activities, like flyball. There are many ways to work and build drives safely. But the point is that drive should always be developed for a specific purpose and with an appropriate outlet. Furthermore, the dog has to learn how to focus while in drive; if you train basic obedience while in drive, then the dog is basically training itself, but in an amplified state of being. For the record, I see more dogs in no-pull harnesses than I do the regular kind, so it’s not like they’re sprinkled with magic anti-pulling fairy dust. That said, there are people who have some success using them to manage pulling. My standard response is that if something works, you have to ask why. Basically, when the dog hits the end of the leash, the entire body gets swiveled around. Due to the placement of the straps, it also tends to squeeze the shoulder blades apart, which can be painful. For some dogs, this is aversive enough to stop the behavior.